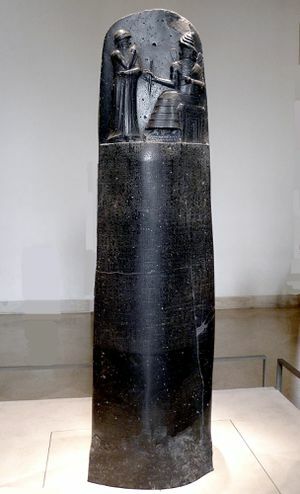 Code of Hammurabi's one of the earliest documents that describe the system of bottomry, where owners would borrow money and return it with interest to lenders. This system was a form of insurance to protect cargo for the owners. Insurance, or at least its concept, has a very ancient and somewhat complex origin, where examples of insurance exist in ancient China and Mesopotamia. Insurance has its origin in commerce as a way to protect shipments of trade against possible loss to the merchant. The idea of risk and loss of property or transactions during trade were worries for merchants, particularly in sea voyages, which were often very risky in early periods. This led to the emergence of insurance as being an important part of the trade that only later began to extend to other areas in the Enlightenment. The earliest documented evidence for insurance derives from Mesopotamia, including the northern and southern regions. Insurance likely develops by the 3rd millennium BC, but most of our earliest texts about early forms of insurance derive from the early 2nd millennium (around 1800 BC). In this case, bottomry (Figure 1), a system where the owner of cargo would borrow money and pay that money back after the safe arrival of the cargo, was developed. The system may have been utilized by ship merchants mostly or even adopted for trade caravans consisting of donkeys or pack animals. In the case of shipping, if a ship reached its destination, then the loan taken for the shipment would be given back with interest. Other examples include caravans during the so-called Old Assyrian trade colonies period between Anatolia and northern Mesopotamia or modern day northern Iraq, roughly around 2000-1800 BC. This trade connected the ancient city of Ashur, which export wool and textiles, for caravans of silver and gold in particular. These caravans would have contracts associated with them, where these were written on cuneiform documents that describe that investors in these caravans would pay or borrow money so that if anything happened to the caravan as it moved to Mesopotamia, or between Anatolia and Mesopotamia, then funds would cover that loss. In these examples, there is no evidence of private insurance at this stage. However, owners or investors of caravans either distributed risk among themselves or simply borrowed money to pay and cover for the possible loss of their trade. This early form of insurance was more about risk sharing and spreading potential losses between investors so that the loss of cargo or trade would not be disastrous to any one individual. By the mid first millennium BC, in the 5th century BC, during the time of Achaemenid Persian rule of Babylonian (i.e., southern Mesopotamia), the Murashu banking firm and family also seems to be involved in issuing insurance to their customers. This firm is among the earliest known private corporations that are named and their involvement in insurance makes them among the earliest known insurance companies anywhere. Perhaps roughly contemporary with early forms of insurance in Mesopotamia, another form of insurance existed in China. This was similar to the risk sharing concept in Mesopotamia, where merchants also seemed to have been the early practitioners of insurance. Similar to the Old Assyrian colony example, the idea was that any loss of cargo would not be disastrous to any individual if the property were shared during transport. Merchants would divide their goods between themselves and ships would carry roughly an equal amount of cargo in groups. Therefore, if a ship sunk or were destroyed, then the merchant who owned that boat would not lose too much of value from one boat, as some of the cargo could reach its port. Figure 2. 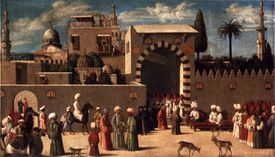 The Venetian merchants in Damascus were very active in trade in the late Medieval period, helping to spawn new developments in insurance. While the Murashu archive suggests an early form of an insurance company, the details are still unclear, and insurance was still relatively primitive. Insurance firms in the late Medieval period, at around 1300, in particular, related to Genoa and later Venetian traders, begin to show more sophistication of insurance as shipping trade once again began to expand rapidly along the Mediterranean basin. Double-entry book keeping, enterprise risk, and investment firms begin to emerge in the commerce states of Italy. By this time, the critical development was that insurance becomes a separate enterprise from loans and other forms of commerce. In other words, it begins to be seen as its own economic enterprise or a form of business. With insurance beginning to emerge as a separate entity, this eventually paved the way for it to spread beyond simply commercial interests to other fields such as private holdings. By the 17th century, for instance, property insurance develops to cover major disasters, which was a concept born from the Great Fire of London in 1666. With insurance emerging as an enterprise separate from other trade and commerce, and greater awareness of disasters, made clear by the Great London Fire, we then see the emergence of what becomes modern forms of insurance that are prevalent for many types of things, covering basic households, to large businesses, and even governments. We can see that insurance began as something mostly used as coverage for owners of trade vessels or cargo. Simple forms of insurance included risk sharing, such as that in ancient China, where goods would be spread out between owners of vessels to a more developed lending system developed by the Babylonians and Assyrians. In the mid-first millennium BC, we see the rise of the insurance firms, in the form of the Murashu family firm representing the best-known example. Significant developments after that emerge again as more trade within the Mediterranean begins to thrive in the late Medieval period. At this time, insurance begins to be a more independent economic sphere. It is only after the Great Fire of London, however, do we then begin to see the spread of the idea or concepts of insurance to other areas such as general property and other areas. After the 17th century AD, the concept of insurance begins to then spreads to northern Europe and beyond during the Renaissance. What Caused the Rise of Agriculture? ↑ For early development of insurance and how it related to trade, particularly sea-borne trade, see: Landes, David S, Joel Mokyr, and William J Baumol. 2010. The Invention of Enterprise: Entrepreneurship from Ancient Mesopotamia to Modern Times. Princeton, N.J.: Princeton University Press, pg. 97. ↑ For more information on bottomry and how it developed, see: Thoyts, Rob. 2010. Insurance Theory and Practice. Milton Park, Abingdon, Oxon ; New York: Routledge. ↑ For information about insurance and the Old Assyrian trade colonies, see: Barjamovic, Gojko. 2011. A Historical Geography of Anatolia in the Old Assyrian Colony Period. CNI Publications 38. Copenhagen: Carsten Niebuhr Institute of Near Eastern Studies, University of Copenhagen : Museum Tusculanum Press. ↑ For information about the Murashu family and their involvement in providing insurance to their clients, see: Hillprecht, Hermann Vollrat. 2013. Business Documents of Murashu Sons of Nippur Dated in the Reign of Artaxerxes I (464-424 B.C.). Nabu Press. ↑ For methods of risk sharing in early insurance in China, see: Eeckhoudt, Louis, Christian Gollier, and Harris Schlesinger. 2005. Economic and Financial Decisions under Risk. Princeton, N.J: Princeton University Press, pg. 45. ↑ For information on how late Medieval insurance developed in Venice, see: Madden, Thomas F. 2013. Venice: A New History. New York: Penguin Books. For information on Genoa and it’s a form of insurance development, see: Van Doosselaere, Quentin. 2009. Commercial Agreements and Social Dynamics in Medieval Genoa. Cambridge ; New York: Cambridge University Press, pg. 196. ↑ For information on how the Great Fire of London shaped insurance in later decades and even into the modern era, see: Mokyr, Joel, and Oxford University Press. 2005. The Oxford Encyclopedia of Economic History. New York: Oxford University Press. http://www.oxfordreference.com/view/10.1093/acref/9780195105070.001.0001/acref-9780195105070. This page was last edited on 14 December 2018, at 19:49.